Hello Friends - woohoo, we're almost there...a few more days, and then it's a 3-day weekend! I don't know about you, but I'm counting down the minutes - it's like the unofficial kick-off to summer....when the sun seems to shine a bit brighter and all the fruit taste sweeter. Okay, enough day dreaming, and on to today's cards. Here's my interpretation of this week's Mojo Monday sketch (I also gave myself an extra challenge by using my scraps). 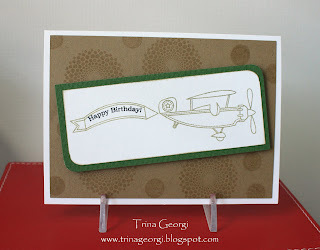 Here's another card, using Papertrey's "Fly Away" stamps. This is the stamp set designed by Becky Oehlers. I'm loving her designs, and can't wait until her next release (Becky....pretty please make it soon!). OOOH...I'm being beckoned by my hubby....it's PIZZA time! Love your take on the Mojo Monday! 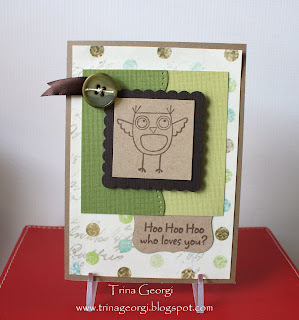 The owl is adorable - they seem to be all over the place lately, and would probably be super cute on a baby card too. Have a great Memorial weekend!!! Very cute owl and a nice card!! What a fun interpretation of the sketch. Yeah for you for using scraps!